Launch Scenario Explorer by selecting Scenario Explorer from the InfoSWMM and InfoSWMM SA Scenario Menu or by clicking the Scenario Explorer button ( ) on the InfoSWMM H2OMap SWMM InfoSWMM SA Control Center Toolbar Standard Toolbar . You will see the following dialog box. Activate Activates the selected/highlighted scenario. ID Counter Use this to set the automatic Scenario ID assignment option by selecting the Prefix, Id counter, and the increment steps as you wish. Copy Copies the input data information of the selected/highlighted scenario to the clipboard. After using the tool, the Paste and Replace and Paste as Child tools will be activated and can be used to transfer the information to another scenario. 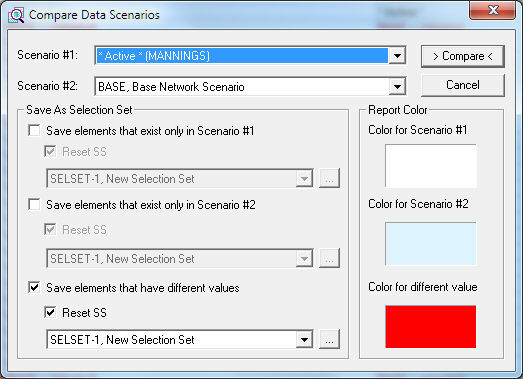 Edit Active Scenario While working in the Scenario Explorer, the currently active scenario cannot be changed or edited. To edit the datasets associated with the active scenario, click this Edit Active Scenario button. To change items on the General or Facility tabs, you must make another scenario active (at least temporarily). Batch Run With the Batch Simulation Manager, the user can select the desired scenarios and run each model in a “batch” (i.e., at a time). Compare Scenarios Opens the Scenario Data Comparison Report. The last comparison will be displayed. The report has a button to create a new comparison if desired. Scenario Display Window IDs and descriptions of the available scenarios is displayed here. In addition, the relationship between a parent scenario and its child, defined as inheritance, is displayed in this box. InfoSWMM shows this relationship in the form of a directory tree. All scenarios are children of the *BASE* scenario until some element of the child is made unique from the parent (such uniqueness comes in the form of data sets, facility sets, or option sets). In the example below, RUN_14 is a child of RUN_12, RUN_12 is a child of RUN_10, and RUN_10 is a child of BASE. When a change is made to a parent, unless some facet of a child is unique, it will inherit the change through inheritance. General Tab The Scenario Explorer – General tab enables editing of InfoSWMM H2OMap SWMM InfoSWMM SA ‘s simulation and report option parameters, and the climatology settings for the selected/highlighted scenario. Facility Tab The Scenario Explorer – Facility tab enables adding/removing facilities to/from a scenario. Data Set Tab The Scenario Explorer – Data Set tab enables modifying input data for InfoSWMM H2OMap SWMM InfoSWMM SA ‘s visual and non-visual data objects. InfoSWMM H2OMap SWMM InfoSWMM SA’s Compare Data Scenario command allows you to easily monitor the differences in input data between any two scenarios in a model. 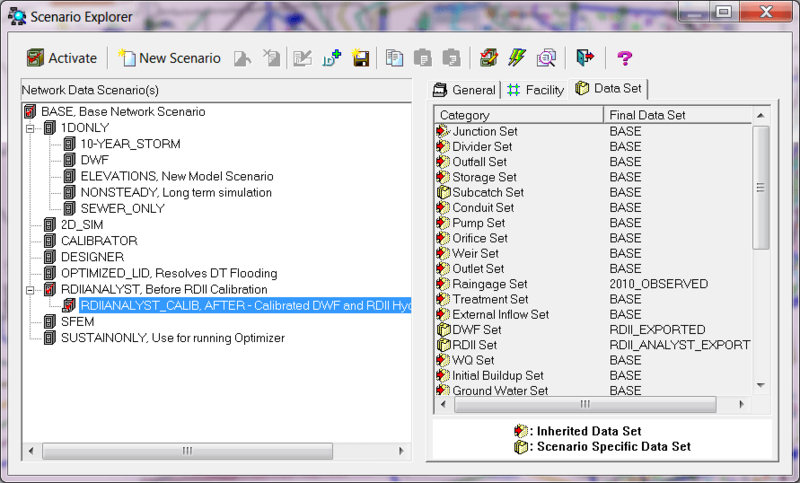 Select Compare Data Scenario from the InfoSWMM H2OMap SWMM InfoSWMM SA Scenario Menu. This will display the following dialog box. Save Results to Selection Set You can save selection sets based on the three analysis results. These can be used for later reference if you wish to make amendments based on these results. Elements only in Scenario #1 – For any elements that exist in the first scenario, but do not have a matching element in Scenario #2. Elements only in Scenario #2 – For any elements that exist in the second scenario, but do not have a matching element in Scenario #1. Elements with different values – Identifies elements in either scenario that has different attribute values. It may be desirable to highlight specific data items, such as elements having different conduit diameters or junction inflows between the two scenarios. Reset Selection Set You may want to use a regular re-setting for the selection sets created for Compare Data Scenarios. If checked, this implies that, each time the Compare Scenario command is carried out, the existing selection set is cleared and replaced by the new result. Compare Executes the comparison. Click the compare button to perform the comparison. Cancel Use this to close out of the Compare Scenario dialog box. New Comparison Initiates a compare data scenario editor and enables the user to do another scenario comparison. Inheritance Path – Shows each scenario’s inheritance (from each of it’s parent scenarios, and their respective parent scenario). Facility – Describes the facility specification option used for the scenario. Simulation Option, Climatology Setting, Report Options – Settings made through the General Page of the Scenario Explorer dialog box. Data Sets – Lists data sets available/used for the scenarios. Select the first scenario you wish to compare from the Scenario #1 drop down list. From the Scenario #2 drop down list, select the scenario you wish to compare to the first scenario. If you wish to save the comparison result, you can save selection sets to refer to at a later time (i.e. from the Domain Manager). For information on creating a selection set, refer to selection sets. you must have different selection sets selected for each comparison result that is to be reported. If you wish to overwrite an existing Selection Set, ensure that the Overwrite option is checked. You can select an existing Selection Set to use, or you can create a new selection set. If you wish to save a Selection Set based on the elements that are in Scenario #1, but not in Scenario #2, check the Save elements that exist in Scenario #1 only option. Alternately check the Save elements that exist in Scenario #2 only option to save a Selection Set based on the elements that are in Scenario #2, but not in Scenario #1. If you wish to save a Selection Set based on elements that have different values between the two scenarios, check the Save elements that have different values option. To conduct a comparison of scenarios, press the button. Results will be displayed in the scenario comparison report.